Richard Allan Jones (pen name Rich Allan) is a former communications executive who worked in radio, television, film, and public relations/marketing for nearly thirty years. He is a published author, television, stage and film director, actor, musician, singer, and songwriter. Jones is listed in Who’s Who in Entertainment and accredited by the Public Relations Society of America. He holds an M.A. in Journalism and a B.A. in Radio/TV/Film and Theater from the Ohio State University. Jones has been married to his lovely wife Diane for 44 years and has two children. An Army veteran, he proudly served his country as a 1st Lieutenant during the Vietnam War era. Jones resides in Los Angeles, California, with his wife, a beagle named Lily, and three birds. Everyone in connection with President Walter Kendall is getting murdered but why? 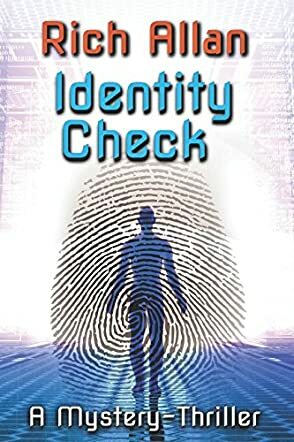 Identity Check by Rich Allan is a chilling thriller that immediately starts off with suspense, murder and intrigue. The first victims were Democratic Senator Calvin Mills and his wife, Judy. They were murdered in the comfort of their own heavily secured home, along with the agents assigned to protect them. With each chapter, Rich implants a barrage of questions for you to ponder, beginning with what do Frank Tate, Vince Terrell, Christina Harold (Denson), Scott Harold, Jessie Sterling, First Lady Gloria and President Kendall all have in common? Rich weaves Identity Check as a masterful black widow awaiting its prey for the next feast. Let me give you a little teaser. After the death of Scott’s mother, Mrs. Harold (Denson), he discovered that President Kendall is his father. Scott and his girlfriend, Jessie, began a journey to find out the truth. But as they embark on the path, will they too become the next victims? I enjoyed reading Identity Check by Rich Allan. As I began to take my first bite, I loved the taste. Then I began to chew on each chapter and, as it touched my palate, I began to savor the flavors. I wanted to know who this person is, why did they do that, and what happens now? Was this a professional hit? What were the real connections? Identity Check by Rich Allan would be an ideal movie script because of its storyline built with intrigue, mystery and suspense. Pick up your copy today of Identity Check by Rich Allan to find out if Scott discovered the truth and what happened next. Scott Harold is a young man enjoying college life with his girlfriend, Jessie, until he learns that his mother, Christina, has been murdered and everything she had ever told him about his “dead” father is a huge lie. Scott and Jessie take it upon themselves to find out who killed Christina and to learn the truth about his father. The two find themselves suddenly in danger because someone is trying to kill them too. Nothing that the bad guys do can stop Scott and Jessie and their search will take them all the way to Washington D.C. before the mystery is uncovered. President Walter Kendall is running for reelection, but his reputation as a ladies' man and several shaky deals are keeping his ratings down. Gloria, his wife, is angry and hurt from all of the years he has been unfaithful, but believes that if she could only have a baby, everything will come right. All of these people intertwine with each other with twists and turns until the surprising conclusion. Identity Check is truly a book reflecting today’s times; it felt real and possible in the politics of today. There is suspense, murder, love, friendship and so much action happening on every page, it is impossible to stop reading. Identity Check is everything you could want in a mystery, thriller, and suspense read. Rich Allen created real life characters that I found impossible not to love or hate. The writing had the action going from beginning to end and mostly keeping me on the edge of my seat and worrying about Scott and Jessie. This is a must-read book if you like up to date political mystery and intrigue. I suggest you put this one on your reading list today. Identity Check, a mystery thriller by Rich Allan, contains a fast-paced, edge-of-your-seat plot. Senator Calvin Mills and his wife, Judy, were the first murder victims. Then widow Christina Harold, who lived in Middleton, Ohio, was killed by the same man. Her college-aged son, Scott, and his bold girlfriend, Jessie, were determined to find her killer. Their dangerous adventure took them to Washington, DC. Add in the ingredients of President Walter Kendall and his wife, Gloria, and his devoted campaign manager, Vince Terrell, and an intriguing story develops. Frank Tate, who was released by a psychiatric hospital in Tennessee through the gifts of a benefactor, also plays an important role. His only goal is to facilitate the release of his two sisters from the same facility. While it seems these story lines are not connected, the connections eventually become clear. There are a number of fascinating characters in this story, but the reader can easily keep track of each one. The author presents each one in exacting detail, and the development of them is enhanced greatly by motivations and secret lives. Although the plot contains many harrowing moments, the relationship between Scott and Jessie adds a sense of romance and comic relief. Jessie is quite a brash young woman; some of her comments make the reader laugh out loud! She is also quite devoted to her boyfriend who is facing life-changing events. But, there are characters who are calculating and cruel. Author Rich Allan has written an engaging and thrilling novel in Identity Check. It is a perfect read. From the first chapter of Identity Check by Rich Allan until halfway through the book, readers will have more questions than answers regarding who the bad guy is behind the bloody murders of nice law-abiding folks who don’t deserve what they get. Then, even when readers start to put two and two together, a bigger mystery surrounds the “why” of these brutal deaths. Readers will also find themselves wondering why someone is so intent on getting rid of young college student Scott Harold as he investigates the obvious murder of his mother, when all he wants to do is find out the truth about his father, whom he believed died while he was an infant. Into a nicely controlled unfolding of the plot and the characters in Identity Check, Rich Allan weaves humor, romance, suspense and surprising twists while exploring important issues like childhood sexual abuse and adult sexual preferences. It is quite remarkable just how well Allan blends all these areas into a well-constructed story, where the characters, even the murderer himself, are realistic, and several of whom are tragic figures. Scott and his loving, but outspoken and somewhat zany girlfriend, Jessie, find themselves escaping death by the skin of their teeth several times. The murderer doesn’t like killing innocent people but he has to do it. Why? Is he just simply crazy? And when the climactic ending arrives, as usually happens in the movies or a thriller, do the evil ones get their just deserts? You won’t be able to put the book down until you find out, but don’t be surprised if you find yourself sympathizing with the cross-bow killer and arsonist at the end. Amongst other things, Identity Check is an interesting look inside White House protocols, security, the movers and shakers and those in charge of what the general public knows…or doesn’t know…about White House politics and society. Overall, Identity Check is a sometimes fun, but generally compelling read from start to finish. Enjoy!